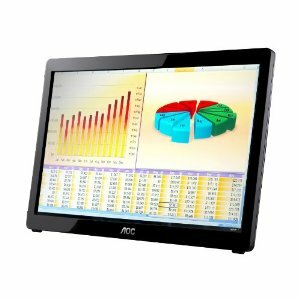 The monitor has a full 16-inch screen, weighs just 2.3 pounds and connects to your computer through a USB port. It draws its power from the computer and needs no power outlet. A small folding support on the back lets it stand on its own, or you can fold that away and lay it flat like a tablet. . The cable that comes with it is about two feet long, but you could attach a longer one, essentially letting you pass the monitor around like a tablet. It works with either Windows or Mac in portrait or landscape mode. The 16-inch version we tried costs $100, a 22-inch version sells for about $160. Is “weights” the proper word, or should it be “weighs?” You are the expert on word usuage, so I am surprised when I see something that doesn’t look right. Because of you, I now own an Associated Press Word Book, or whatever it is called.